"That's right Minako. Don't love anyone. Anyone you love, will only be miserable." "Nobody can love the devil!" It was almost too perfect. Deimos and Venus, two young siblings in love, living in Olympus carefree and sweet. All quite perfect, until their unsavory relationship caught the attention and wrath of Jupiter. Deimos almost got off easy, transformed into a demon, while the unlucky Venus was banished to the bottom of the sea to rot. To ensure a pretty new body for his love, Deimos set off on a quest for the perfect reincarnation of his beloved sister... and he's finally found her. There seems to be a trend in Japanese horror manga: The main character will be a hapless female who, out of no intervention of her own, will be drawn into countless chilling situations. (Uzumaki much?) As it is, Bride of Deimos promises nothing different. Well, with the exception that the hapless female is the destined bride of the Demon Deimos -- God of Fear -- of the times of Olympus looking for a body for his sister/lover. The story of Bride of Deimos revolves mainly around Minako and her newfound adventures as her life becomes surrounded by magic, spirits and other dark creations. She is thrown from one situation to another that she has to solve... or at least survive. Many of the storylines are adaptations of popular mythology -- mainly Greek and Japanese -- as well as urban legends and classic ghost stories. Bride of Deimos pulls the audience into the story from the very first page. 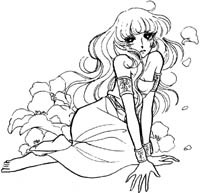 With no formal introduction to the main character Minako, the reincarnation of Venus and the lusted-after body for Deimos's bride, we are made to warm to her through the situations Deimos creates for her. It seems that whenever one is touched by an abnormality, such as a demon, their being is forever a magnet for any kind of supernatural being looking for a victim. For every disaster that befalls her, we are thrown deeper and deeper into the psyche of our tragic heroine. Once a normal schoolgirl, her relationship with Deimos has marred her so that she can no longer afford to be the same. The twist in the relationship between this makeshift Beauty and the Beast is that despite her hatred and aversion towards him, Deimos keeps saving Minako if any harm should come her way. Although if asked, his defense is that he must keep her body in perfect shape to replace the rotting one of his beloved Venus, for he couldn't care less for anybody except Venus. 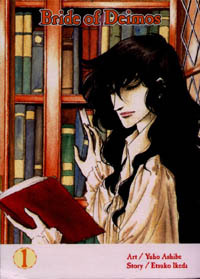 The first volume explodes with that question, if Deimos is indeed falling in love with the kind, sincere Minako and falling out of love with his now bitter and twisted sister Venus. His confusion over the issue causes Minako more grief as the jealous Venus becomes impatient and demands her new body -- risking injury to the body -- as she tries to wipe Minako out for good. So far, luck has been on Minako's side, but one must ask -- for how long? Overall, Bride of Deimos is a surprisingly engrossing manga. It is a horror manga at heart, but with so many mythological elements it could almost be fantasy. The illustrations are predominantly inspired by shoujo manga from the 70's and 80's and are very similar to the works of Ryoko Ikeda. 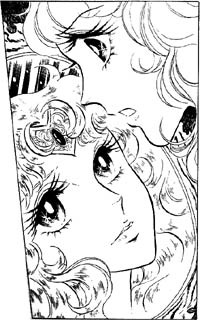 (Rose of Versailles, Brother Dear Brother) As a horror manga, the images are striking although not meant to horrify you with gore, but to shock you into paying attention to the page. It is easily read the original way, in right to left format, and the graphic novel gives you a little instruction page if you aren't familiar with its format.